(I feel like I should start this with Once upon a time…) I was sitting at my dining room table next to the open window and I heard a strange ripping sound. Not a sound I had heard before, so I started to look around. 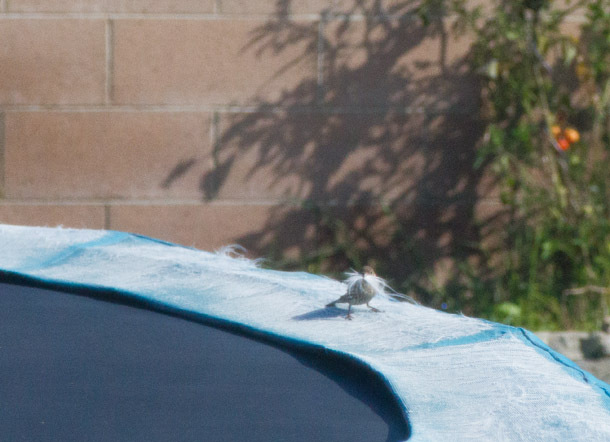 Well, I had to laugh at what I saw: the birds were out on my trampoline ripping at the fabric cover. 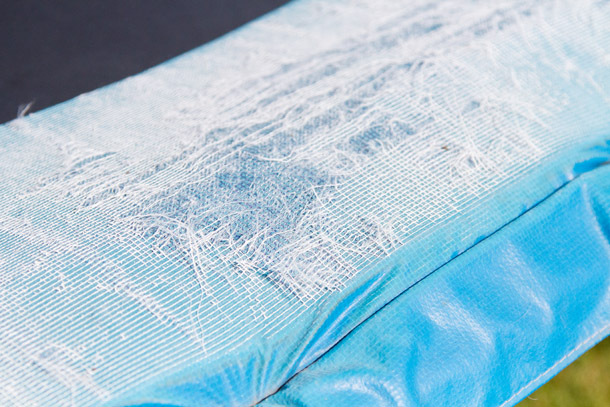 They would take large beakfuls of the white fibers in the cover and take it back to their nests to line the nest with the soft material. How cute is that? So, I’ll back up a little, about a year ago I had the pleasure of jumping on my cousin’s trampoline. Loved it! Great exercise and wonderful fun! So, I needed to go out right away and get one for myself! I went on Craig’s list and found one pretty close to Dan’s work and it was cheap to boot! (I saw some that were free, but they were a little far away and/or not as nice looking.) So, we went out the following weekend and gathered up our new exciting find! After putting it together in our backyard, I had a great new piece of exercise equipment. Dan, of course, had a better idea for it… a hammock. Well, let’s just say that he was right! It makes a great hammock, and that’s mostly what it’s used for now. We lay out there at night and watch the stars and we watch for the International Space Station to pass overhead. You can track the space station and other cool things using the Sputnik app or with NASA. Yep, I’m a nerd! Anyway, back to the trampoline… The cover had become worn and sun faded over the year that it was out there, which made it easy for the birds to start picking at it. 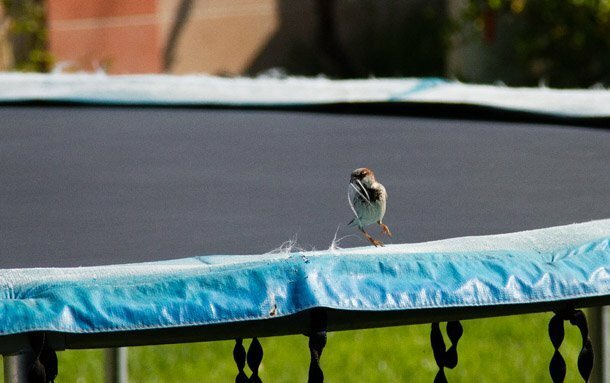 And, while I was sitting around with the injured leg I was able to catch a few pictures of the birds stealing the trampoline bits, so I thought I’d share them with you so that you could get a laugh as well. This shot was taken through the screen in the window, so it’s a little on the blurry side, but I love the Lorax mustache that this little bird has! This is what the cover looked like… all torn up and frayed from those cute little birdies! Since these pictures were taken the cover was actually all used up. At Easter, the kids just loved it to death. And, my sweet cousins have purchased a replacement for me. Not that they are responsible at all for the cover’s demise, but they are just that sweet! I’m really hoping that they come back when the nice shiny new (not bird-damaged) cover is on the hammock, er I mean trampoline. Don’t you just love nature? We try to make our yards all upmarket and personalised and nature comes along and integrates itself back into the equation whether we like it or not ;). Lucky we both like it isn’t it? We get butcher birds eating the dogs bones, birds stealing fibres out of anything that they can come nesting time in spring and the rest of nature trying to eat its way through Serendipity Farm and out the other side…you gotta love it (or you cry 😉 ). Who doesn’t love recycled building materials? Smart birdies!